The first edition of the #NPHTop25 received extensive feedback, positive and negative reviews, along with no shortage of debate! Well, here goes 2014 edition number two, where teams across Canada trade spots and jock for position. First off, we have a new number one. St Mike’s defeated #4-ranked Henry Carr, who took care of previous #1 Oakwood, at the St Mike’s invitational. SMC steps into familiar territory; the Blue Raiders took the #1 spot in 2013 at the exact same time, and never reliquished it, ultimately being crowned OFSAA provincial champion. Can history repeat itself? Former #1 Oakwood suffered two losses at the St Mike’s invitational (Henry Carr, Campion) –more defeats than they’ve had all season. On their resume now is a total of three L’s; not bad, but the latest two hurt the Barons. Gleneagle defeated Walnut Grove 83-76 at the Legal Beagle, but we’re not quite ready to hand them the higher spot, with respect to the defending provinical champs, combing the fact that Grove had their star Jadon Cohee recovering from ankle sprain, and more importantly, Gleneagle lost to Grove twice earlier in the season, to make the heads up match up 2-1 in favour of the defending champs. That being said, Gleneagle climbs the ladder. 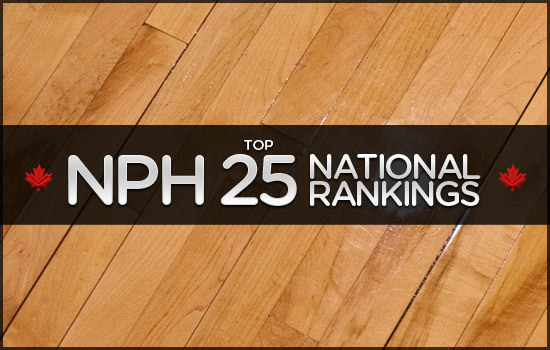 Perennial power Henry Carr is currently in British Columbia as this edition of the #NPHTop25 is released. This trip to compete in the Snowball Classic will provide the country with unique perspective as it will be the first time that an NPH Top 5 team from Ontario will go to battle against some of the best in BC. Former honourable mention Leboldus jumps up into #NPHTop25 after cruising through the BRIT invitational–one of the biggest high school tournaments in Western Canada. Within the next couple of weeks, there will be more major tournaments to track from coast-to-coast. At this point in the season, teams have a good understanding of where their at, and where they could go. City championships are right around the corner, provincial championships are approaching…but first there is still business to take care of, for the opportunity to reach those heights. The formula is straight forward. Glen Eagle (Coquitlam, BC) – Winners of the Leagle Beagle. Javon Masters Making CIS History? AAAA OFSAA Tips Off in Nation’s Capital: Holy Trinity with First Round Scare, Marial Shayok Drops 35 + more! OFSAA Preview: St Mikes, Catholic Central Grab #1 Seed, Heat Level Turning Up in Windsor!